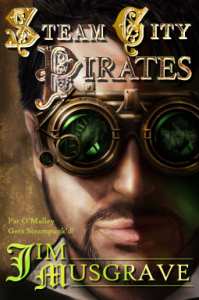 Jim Musgrave's "Steam City Pirates" is a fresh steampunk mystery that will have even the most seasoned steampunk fans clamoring for more. The story is about Pat O'Malley, a man with a troubled past who seeks to save the city he loves from evil forces. O'Malley's character is well-developed, and it is engaging to read his inner monologues. Musgrave also did a thorough job penning the other characters, but his main strength is in describing scenes. The world of "Steam City Pirates" feels rich and lively and includes many steampunk attributes. Musgrave states in the book's introduction that many of his influences are outside of the steampunk genre, such as Edgar Allan Poe, and the gothic and SciFi contributions to the story add a unique flavor. One of the highlights of the book is it multimedia, with illustrations, links to online games, and a music playlist, which makes reading the book feel like a full experience. Overall, the book is perfect for steampunk fans who want a new, yet still familiar, take on the genre.